Comfort for cats doesn’t stop with townhouses, which is why The Cat’s Inn offers cat beds and pillows to help keep your feline friends cozy during their stay away from home. 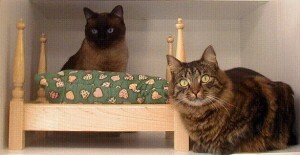 The four-post cat beds from The Cat’s Inn are as cute as they are comfortable, offering cats a great place to relax and nap. Available in your choice of oak, maple or cherry, each bed stands 12 inches tall and 12 inches wide, with a 16-inch length. The included mattresses are fully washable and available in a varied range of colors and patterns. Whether placed inside a cat townhouse or alongside your own bed at home, these cat beds are perfect for any small to medium cat weighing up to 16 pounds. Cat pillows are also available that are sure to be perfect for your pet – that is, unless they prefer the shipping box it comes in! 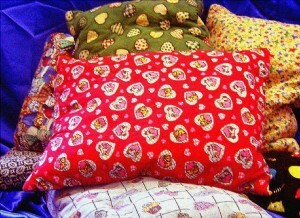 Pillows are also available in a variety of styles and colors and are fully washable just like the bed’s mattress. These pillows measure 12 inches by 16 inches, and will surely become the new favorite lounging spot for your feline friend. Handmade hardwood beds, available in Oak, Cherry or Maple. Comes complete with washable mattress for your loved one. Perfect for any small pet up to 16 lbs. Washable mattress 12″ x 16″. Patterns and colors vary. Your pet will love it. To learn more about The Cat’s Inn’s cat beds and cat pillows or to place your order, contact them today by calling 877-228-7466.